“You ever see that before? Goddamn, I’ve never seen that before!” someone in ROTTENTAIL yells after blowing a poor old guy’s head off, with much blood gushing forth. Anyone inclined to watch a movie like ROTTENTAIL, on the other hand, probably has seen gags like that many times before, and the film doesn’t bring enough that’s fresh or clever to its mix of splatter, swearing and occasional scatology. It’s based on a graphic novel written by David C. Hayes (who also scripted the movie with director Brian Skiba) and Kevin Moyers that I haven’t read, but the evident model for both is THE TOXIC AVENGER, with its story of a nerd who gets mutated into a semihuman monster and wreaks bloody vengeance on his tormentors and other evildoers. In this case, it’s dweeby scientist Peter Cotton (Corin Nemec), who works in an extremely low-rent but very colorfully lit fertility lab, and still bears the trauma of a bullied childhood. (Anyone watching this movie because they like bunnies will want to avert their eyes when a flashback reveals the fate of his pet rabbit.) There was one pretty girl who liked him back then, and in the present day, Anna Banana (Dominique Swain) returns to town for their Easter-weekend high-school reunion, and also to enlist Peter’s help in stopping sleazy televangelist Pastor Jake Mulligan (William McNamara) from tearing down her grandfather’s church to make way for his new Mulligan Ministries outreach center. As fate would have it, Jake was Peter’s chief persecutor back in school, and as more fate would have it, Peter gets bitten and hideously infected by a monstrous experimental rabbit just as Anna comes back into his life. His transformation into Rottentail is first signaled by one hand becoming a paw, and foul things uncontrollably coming out of his mouth as he sits in a diner with Anna. This is the movie’s best scene as Peter amusingly switches temperaments, and Nemec goes completely all in on both sides of his performance. Once he has become fully altered into a bunnyman creature, he enthusiastically growls his Rottentail rants and wisecracks in a voice kinda like Beetlejuice’s. It’s a shame, then, that little of what he has to say after that diner scene is especially witty or funny; Rottentail laughs a lot more at his own jokes than the viewer is likely to. As he rampages his way toward what promises to be a violent reunion with Jake, the filmmakers throw plenty of gore gags, gross-outs and cartoony sound effects (including flatulence, of course) against the wall, but only a small percentage stick. 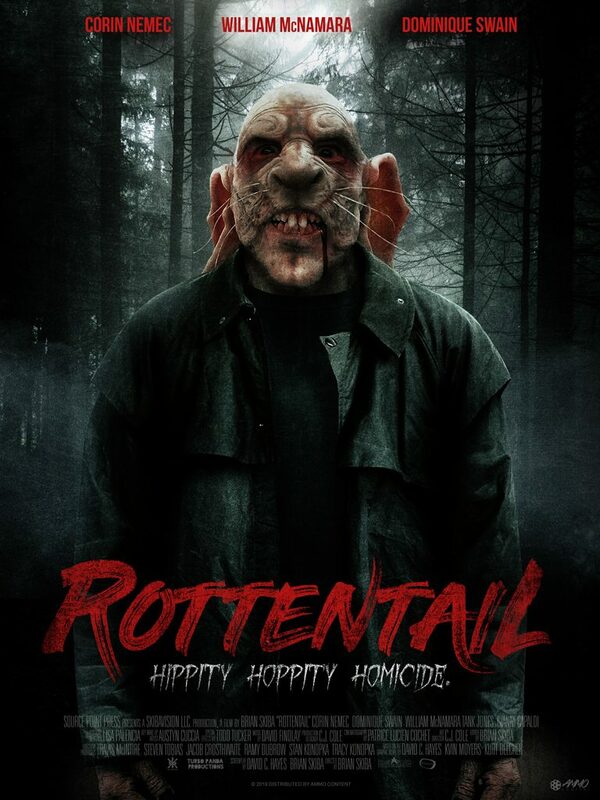 ROTTENTAIL lacks the pell-mell pacing that an in-your-face exercise like this needs to work, and there isn’t nearly enough plot or interesting incident here to justify the 106-minute running time. Give credit to the creators for attracting a more experienced leading cast than one might expect under the circumstances, and Todd Tucker has done a fine job with the old-school creature and makeup effects. Their efforts, however, can only go so far with material that’s more random than imaginatively outré (a general played by the aptly named Tank Jones becomes a cyborg because why not? ), and is devoted to sick humor that ends up being more sick than humorous. Toward the end—SPOILER ALERT—it takes a particularly misguided turn by not allowing Peter/Rottentail to achieve the revenge the whole story has been pushing toward. I can’t speak for everyone, but a “You have to stop all this killing!” appeal to the conscience is probably not what most fans want from a determinedly trashy B-movie like this one.